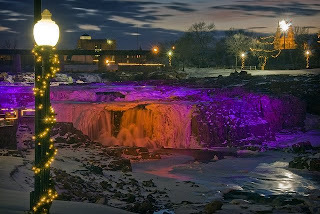 I'm guessing South Dakota doesn't have the market cornered on big fancy Christmas light shows, but Sioux Falls has to be one of very few places that includes a gigantic colorfully-lit frozen waterfall in the middle of things. The Falls Park Winter Wonderland show is pretty spectacular and can make some great photos. This is shot from the balcony of the Falls Park Cafe just after sunset so I got that little bit of light left in the sky. 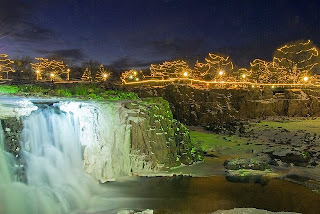 From the viewing platform nearest the east side of the Falls, you can include a large portion of the lights that cover pretty much every tree in the park. Notice that compared to the shot above, the color of light on the Falls themselves has changed below. The colors on the spotlights change every 30 seconds or so. Waiting for the right combination of colors and then timing your exposure so you capture the hues you want is part of the game here. If you were looking closely at my first shot, you may have noticed the Sioux Falls Cathedral in the upper right corner, partially obscured by a light. 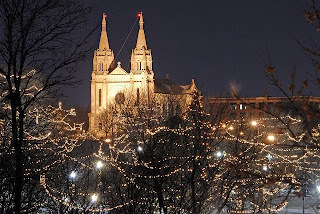 By moving completely out of Falls Park and across the street to a used car dealer's lot, I was able to get the cathedral rising out of a sea of Christmas lights. Where ever I am shooting, I try to remind myself to look around and keep an open mind for unexpected shots. Here I noticed the colored spot lights reflecting on a portion of the Big Sioux River below the actual Falls. If you didn't know this was taken in a city park with artificial lights I might have been able to convince you this was moonlight reflecting here. I started noticing the patterns of ice frozen on the Falls and decided they would be better photographed in the daylight. 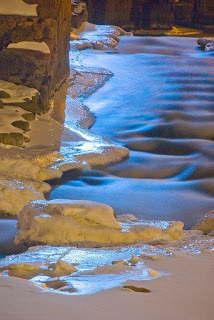 So the next morning, I captured this contrast of still and moving water. Sunlight began glinting off several places in the cascade of water, but I wasn't sure which shutter speed would best show the flow. 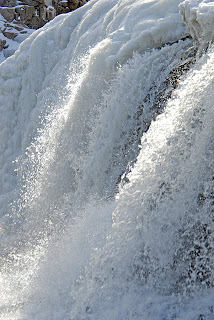 So I shot some at 1/350 of a second, photographically "freezing" the water that wasn't frozen. And then without moving the tripod, I switched the shutter speed to 1/6 of a second and let the falling water blur. For info on Falls Park in other times of the year, look here. Falls Park is nice, but those colored lights on the river look a little goofy to me. It's not your fault. I do, however, really like your picture of the cathedral from the used car lot. 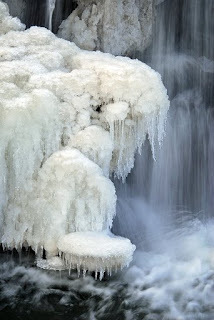 I like both the photographically frozen water photo and the later. They both have a great visual appeal. Thanks guys. Can't disagree that the colored lights look unnatural on the falls, but as photographers we sometimes have to live with the cards we are dealt.